There’s a top notch new electronic magazine in the retro video gaming scene. Called the Retrocade magazine, it has been written by video game players for video game players. The magazine is crammed with a mix of articles on high scores, homebrews, and classic arcades - over 100 pages worth. As if this wasn’t interesting enough, there is a piece about the attempts of recording the highest score on the Vectrex version of Star Castle and there are four reviews of Vectrex games. This includes Scramble, Star Castle, Space Frenzy and Vector Pilot. Yours truly wrote the review for the latter game. Overall, this magazine makes for very interesting reading. Available in PDF format at a cost of $4.99 it can be purchased from here. Of interest to Vectrex fans here, is that a modified Vectrex will be present on the SpecialEffect stand at Replay. SpecialEffect is a charity dedicated to helping all young people with disabilities to enjoy computer games. The Vectrex at Replay has been provided by OneSwitch.org.uk and has a special controller which has just one button for game play. This button is used for hyper space. There are no other controls and during the game the ship rotates and fires constantly. This completely changes the way Mine Storm is played, and the idea then is to hyperspace your way out of the path of any floating mines. Boy oh boy, Vector Pilot was worth the wait! This game is awesome. If you didn’t own a Vectrex console before, this game would surely make you buy one. Based on the 80's arcade game Time Pilot, this is a vector based version for the Vectrex. The game play is true to the original Time Pilot version and includes all the different time zones in which you fly your fighter plane. In addition Vector Pilot includes lots of hidden features waiting to be unlocked and therefore unlike many of the early Vectrex homebrew games, this game has the potential to keep game interest over the longer term. Vector Pilot is produced by Kristof Tuts, the same author who previously made Vectrexians. Like Vectrexians, Vector Pilot comes shipped with a beautiful overlay which really does add the illusion of colour in the game graphics. The video I made doesn’t do the game justice (Vectrex graphics are notoriously difficult to capture on camera). If you buy just one game for the Vectrex this year, make its this one. VectrexMad! Score 5/5. For more info about purchasing visit Kristof’s website. Being a cross of the old Vectrex forums (R. I. P.) and a vector gaming forum on Yahoo! Groups (also long dead! ), the vector gaming forums takes things a few steps further by also having discussions on raster vector ports and even current vector-like online and portable device/cell phone games. There are also forums for any kind of game console, from the oldest Pong machines to the most current gaming rigs available such as the XBox 360, but the main focus are on the beloved wire-frame games. This will be a six game tournament to be played on original Vectrex hardware (including controllers). Multicarts are acceptable. Tournament overall scoring will be the average of the player's percentage score across all six titles. All titles must be played to qualify in the tournament overall standings. Tournament results will be published in the first issue of Retrocade Magazine this fall. You need to register to vote for the games to be played and/or submit your scores during the tournament. You can find more info at the Retrocade Magazine forums. Sunday 21st August - Vectrex high scores - Keep them coming! Ok, the Hi-score page I added to this site is not as official as the Twin Galaxies high scores (I don’t ask for video proof, only photograph proof, and the results will never get in the Guinness book of records) but nevertheless the page is receiving regular attention from Vectrex fans. Typically every few weeks I get an email from somebody who has got a new high score. And it seems there are some Vectrex gamers out there with super human game playing powers. In April this year Manu from Switzerland sent his score of 396,668 points for the European version of Mine Storm, and a month later DarrylB sent in his high score of 993,181 on the US version of Mine Storm. Recently I was contacted by Devastator to tell me his score of 307,500 for Protector which he achieved in 2003. Then just last week he sent me an even higher score of 326,475 together with photographic evidence! Well done guys - you have my utmost respect, but don’t wear out your Vectrex controllers! Sebastian Tomczak aka Litle-Scale, is a chiptune artist based in Australia who uses retro game consoles, computers and other electronic gadgets to compose and perform new music. He appears to have cracked it, and turned the Vectrex into a proper MIDI instrument. For those that don’t know, MIDI is an industry-standard protocol that enables electronic music instruments to communicate with each other. The Vectrex implementation is a slave, and it is allows a PC music sequencer or MIDI keyboard to act as the master controller. In the past Sebastian had demonstrated a MIDI interface that connected with the Vectrex via the two game ports and that was controlled by MIDI sequencing software on the PC. This allowed for limited control of the Vectrex sound chip. Now, Sebastian has produced a more advanced MIDI solution where the user has full control over the sound capabilities of the Vectrex sound chip. Click here for more info. Sebastian will be releasing a step-by-step guide to the construction. Regular readers of this "blog" may recall this year’s January entry in which I presented photos of a Vectrex prototype (scroll to end of this page to see the entry). I showed these images after receiving communication from Justin who had obtained the original photo slides from his father Edward Forsell, who was manager of the modeling shop at MB some 30 years ago. Unfortunately, Justin’s father couldn’t remember any more details about the Vectrex prototype. However, some other information has come to light making the puzzle of the prototype alternate Vectrex even more intriguing. There is a section published in Edge magazine (issue 122) which gives an account by Robert Van den Heuvel who claims to have actually visited the Vectrex factory when he was a child. He gives an account of a Vectrex shaped like a shoebox on the president’s desk. Click on the image of the magazine to see an excerpt of the text. A few days ago DarrlyB of the Vectrex wiki kindly passed on a scan of a Vectrex concept he had received from Miva Filoseta. I am told that Filoseta was one of the staff at Smith Engineering who designed many of the overlays for the Vectrex games. He also got involved in some early Vectrex design concepts which Smith Engineering proposed to GCE. One such drawing is shown below. So is the MB mockup in the photo shoot inspired from Filoseta’s concept? -It does look like there are similarities. However, my speculation is that if any of this information had to connect, its perhaps the description from Heuvel that matches up with the Forsell images. Filoseta worked at Smith Engineering not MB, and his drawings were early Vectrex concepts for GCE. GCE went for the upright black Vectrex design that we are all familiar with. The Forsell images of the alternate Vectrex were taken at MB (so when MB owned GCE). 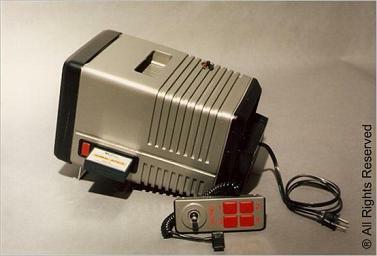 When MB took over GCE, the upright Vectrex design was already in production. The images also show a standard Armour Attack game cartridge plugged in. Surely, the upright Vectrex design existed before the game cartridges? Therefore the Forsell images would seem to suggest that this was a mock up or early prototype for a later version of Vectrex that MB was considering. Perhaps, this "mock up" actually worked and it is this that was reported to be on the president’s desk. As I say, its all speculation on my behalf, so if anybody out there has any facts I would love to know. Added a new link in the [Links] - [Hardware] section to blogger Pavel Urbancik. His blog started in April this year and the entries detail his efforts in making a Vectrex clone. Interestingly, as part of the clone development he has developed a rasteriser which allows the analogue Vectrex signals to appear on a standard (rasterised) display. Not much to report for May. Other than I still have some sets of Vectrex overlays for sale. On some of the remaining overlays I can reduce the price as there are some surface scratches present. These scratches are not visible when the overlays are inserted in the Vectrex but are just about visible when holding and moving the overlays in bright light. Another early Vectrex review (Dec 82) has been uploaded. This one came from Byte - the once mighty but now extinct computer magazine. It must have been a very early review because if you look carefully at the picture it seems that there are no printed cartridge labels. The direct link is here. The Hi-Score page I introduced seems quite popular. In the last few weeks there have been a number of high score updates including a new MineStorm high score of 396,668 by Manu of Switzerland. Head on over to the vectrex.co.uk shop to find out more details about the reproduction Mine Storm and Pole Position overlay pairs that are now for sale. Price for one set of overlays, comprising one Mine Storm and one Pole Position overlay and standard postage, is £18.69 for United States of America, £17.21 for European Community, and £16.43 for Great Britain. The flyer on the shop page shows the total price if overlays are sent by recorded signed for delivery. Recorded delivery is the recommended option as for any overlays I send by standard post I will not accept liability for refunds if the overlays are lost. There's an interview with Jay Smith (father of the Vectrex) at CGE2010, that can be heard on this month's RetroGaming RoundUp podcast. Quite interesting information: Jay mentions about hooking up the Vectrex electronics to a Sinclair small screen TV as a proof of principle for a portable Vectrex console. He also gives the story about the birth of the Vectrex. In addition mention is made of the 3D goggles, light pen, colour Vectrex and MineStorm dust levels. Visit the RetroGaming website and download the RoundUp 29 - March 2011 podcast mp3 and fast forward 1 hour 28 minutes for the interview. Fury Unlimited has just sent out a general email stating that he is working on releasing Warrior for the Vectrex this coming autumn. This game is based on the original 1979 Vectorbeam produced Warrior arcade game. The original game is a classic and can be considered one of the pioneers in the fighting game genre. Fury states that his game is a clone of the original. His version offers a two player death match true to the original and a single player campaign exclusive to the Vectrex. Priced at $65 USD plus postage, the game is a bit more expensive then other Vectrex games but I suspect that is because it will be supplied with a screen overlay and GCE style box packaging. Pre-ordering is now open. For more information visit the Fury Unlimited website. Saturday 6th March - The holy grail of Vectrex collectors:- Mr Boston game cart and overlay currently on ebay. The holy grail of all things Vectrex (at least for collectors), a Mr. Boston Clean Sweep Game Cart & Overlay, is currently listed on ebay (Item number: 320666171889). It is thought, that during the 80's, Mr Boston Liquors were to use these games to promote their liquor in stores. Whether this actually got past concept isn't known. Today, there are only handful of Mr Boston Clean Sweep games known to exist. A Mr Boston game sold in August last year for $7,200.00 (USD) and made headlines everywhere. The one currently on ebay isn't in as good condition but nevertheless because of the rarity there is still a significant "Buy It Now price" of $3,600.00. For those who can't quite reach this amount, offers are also considered. 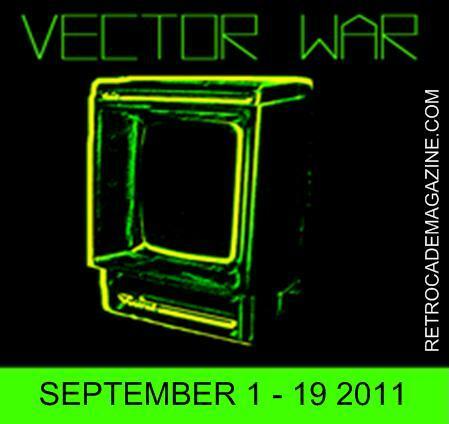 Today Martijn Wenting of Revival Studios announced on rec.games.vectrex a competition for his game Debris Revisited. The deadline for this competition is set at July 1st 2011. There will be prizes for the top-3 scores, as well as for the highest score in Astrododoge (a mini game included on the Debris Revisted cartridge). The prizes are 1) A rare VIP edition of Debris Revisited (only 20 copies released! ), 2) A brand new jumperless multicart by Madtronix, and 3) Any revival studios game of choice. For Astrododge, the highest score will win any Revival Studios game of choice. The lastest scores can be found at the Revival Studio's high scores page. Hot on the heals of the mini Zantis review here’s the video game play footage I took for Revival Studios' recently released "Debris Revisited". Debris Revisited is a vertical shoot'em up game. Basically you shoot at anything that comes your way. The game is unique on the Vectrex in that it uses bitmap graphics (instead of vectors) to good effect. Vector purists will no doubt ask "why done in bitmap raster? -surely all the effort used to trick the Vectrex into operating in bitmap mode could be better spent to produce an equally good or better game using vectors?" Well in fairness this game is visually very good. 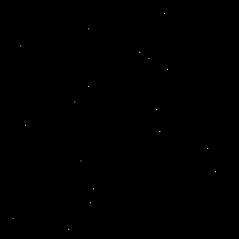 Those rotating asteroids do really look like they are rolling down the screen. As the name suggests Debris Revisited is not a completely new concept. In 2005 Revival Studios already released the first version of the game known as Debris. However, the revisited version has various improvements made e.g. 16 new levels, new enemies and new attack patterns. It also includes the new internet high score function that Revival Studios is putting in most of their latest Vectrex games- Basically, when you get a high score, a unique code is displayed which can be entered online. This allows you to compete with other Debris players and does add extra interest to the game. The updated Debris as with the original Debris makes use of the VecVox module for extra sound effects. Basically, a musical score is played by the Vectrex throughout game play, and sound effect such as shooting, explosions and computer voice are played on the VecVox. The sound of firing the shots is particularly satisfying. However, if you don’t happen to have access to a VecVox (the VecVox hasn't been produced for a number of years) or want to play in two player mode, in my opinion Debris is not so fun. You are then faced with playing a game only with music and no aural feedback for when you have shot an enemy. What would have been nice is if there was an option to turn the music off and instead have sound effects play on the Vectrex. In light of the above I am scoring Debris as follows. If you’re one of the lucky few to own a VecVox, then Debris Revisited deserves a score of 4.5/5 and is a recommended purchase. However, if you don’t have a VecVox I think this makes such a difference to the game that the game merits a score of just 3/5. Like most of Revival Studios’ games, Debris is supplied on a PCB rather then in a cartridge case. This helps to keep the costs down and the game can be purchased for just under 30 Euros, and the price includes postage worldwide. Hooray!! !, at long last Fury Unlimited is making Vectrex games with classic arcade action. This year is starting off on a high in terms of shoot ‘em up games being released for the Vectrex. A couple of weeks ago I received Debris revisited by Revival studios and today I received Zantis from Fury Unlimited. From looking at the Zantis game design it is clear that this game is heavily influenced by the original raster based Video arcade game Spiders (1981) by Sigma En. Inc . This Vectrex vector interpretation is actually very good. In Zantis you control a ship that is moveable in four directions at the bottom part of the game screen. You must maneouvre ths ship and fire upon the fast approaching Zantis enemies. Not only that, but you must destroy their nests so that further Zantis creatures are not forthcoming. Fast and furious arcade action, this is what the Vectrex was designed for! At $35 US dollars plus shipping it’s a reasonable price for a Vectrex game. The VectrexMad! Rating for this game is 4/5. There‘s a new repository of information concerning the Vectrex. A couple of days ago Vectrex fan DarrylB announced that he had been busy making a Vectrex Wiki for some months and that it was now ready for public eyes. What is a Wiki? A Wiki is a collaborative publishing platform that enables communities to, create and share content on any topic. It’s a bit like Wikipedia but is different in that it’s geared towards one subject in particular. There is still a lot of information to go in the Vectrex Wikia but there already is useful information there. So click here to read and even contribute to the Vectrex Wiki. Whilst searching in flickr I came across a scan of an old advert for the Vectrex. The ad must have been in 1984 when MB decided to stop selling the Vectrex and unload their final stock. Wow, check those final prices. Wish I had had the foresight to buy a few Vectrex goodies back then. Image owner Chun Wah Kong kindly let me use this image of the scan he made of the original newspaper clipping. For a clearer image go to the Documents Tab and select Magazines Scans or click on the actual image on the right. What I like about the Vectrex as a hobby is that every once and a while there is new information to be discovered. Be it the binary file for a never released prototype or a snippet of information regarding the history of the Vectrex. Well folks, what I present here today is very very interesting. In September last year, Justin, son of Edward Forsell, put on his flickr page some scanned images originally photographed by his father in the early 80’s. These pictures are of a Vectrex prototype in a different guise that no one had ever seen before. However, these photos remained off the Vectrex fan "radar" until Manu Pärssinen announced 3 days ago on rec.games.vectrex that he had discovered the photos on Justin's Flickr site. I’ve been given permission by Justin to show the images on this website, but the originals can be found on his flickr page. Closer inspection of the images reveals the text "Vectrex MicroSystem or Vectrex VideoSystem" in red writing on the front of the console. The cartridge appears to be standard size (I think it says Armor Attack on it). Based on a standard cartridge size dimension I was able to scale to approximate the overall console dimensions: 180mm(height) x 126mm (width) x 308mm (depth). It’s smaller then the Vectrex we all know, but it’s not that small. I suppose what dictates the volume of the unit is the CRT length. 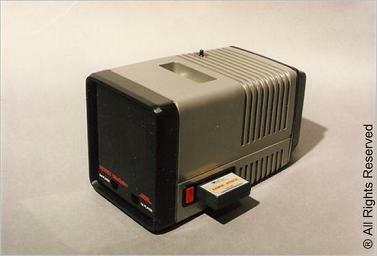 Milton Bradley (MB) bought the Vectrex rights from General Consumer Electronics (GCE). The speculation is that the photos show a mock up made by MB as an alternate design for the Vectrex console once MB owned the rights to it. Edward Forsell was manager of the modeling shop and worked in Research & Design at Milton Bradley for almost 20 years. Justin has said that he will ask his father if he can remember anything about the photos. If there is more info I will be sure to blog it here. Images courtesy of Edward Forsell, photographer and image owner. Two days before the end of last year, programmer Franck Chevassu (aka Parabellum) officially released ParaJVE version 0.7.0. ParaJVE was already an excellent Vectrex emulator (see my old review for Video Game Trader issue 8, p12), but with the latest release, known bugs have been fixed and extra "whistles and bells" added. Of course an emulator executing on any modern day PC with a raster scan monitor, can never hope to truly capture the vector display of the Vectrex. But ParaJVE is the best emulator out there which offers the closest experience to playing games on a non Vectrex. Unlike other emulators, ParaJVE includes options for controlling the intensity, glow, wobble and blur for the emulated vector lines. This all helps to give a more realistic visual Vectrex experience. Included in the distribution of ParaJVE are the original game ROMS and newer homebrews and demos. ParaJVE can now also support ROM sizes bigger then 32KB. Indeed, there are some bigger homebrews and demos included, proving that this function works. Visually, ParaJVE now has an option that shows an image of the Vectrex (see image to right). Overlays for the games can be displayed, and the colours are transparent enough to give true colour to the displayed vectors. You can download ParaJVE for free at www.vectrex-emu.blogspot.com. 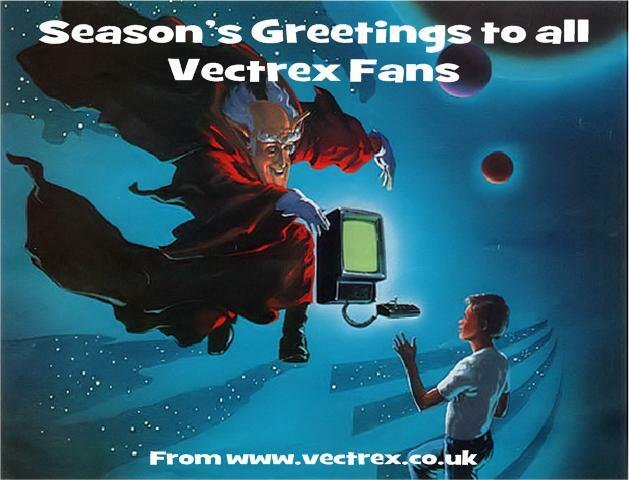 Saturday 1st January - Happy New Year to all Vectrex fans !!! Exactly three years have passed (and over 10,000 hits) since the launch of this site. My madness for all things Vectrex continues. Hopefully, this year will be the year that I can fulfill some Vectrex projects that have been delayed. Plus I've got some new applications and ideas in mind. Tune in to this site (regularly) to be the first to know.